Our story starts a little differently than others. 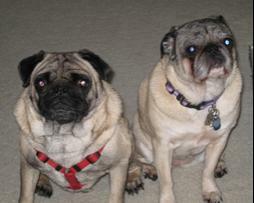 Most people who come to Compassionate Pug Rescue – rescue a pug. That is where our story takes a different twist. My daughter Shelby and I were looking for a companion for our six year old pug Sassy. We contacted Marcia who we had met before through Shelby’s mom who is active with CPR on a Saturday and on Monday we received a call to our surprise. We were looking for a four year old and it seemed like Marcia found a perfect fit. Rio now named Tank was going to be surrendered due to his owner Jose having to move to London for employment. Jose was looking for a loving home; you could hear in his voice and read through his emails that he wasn’t happy about the surrender. We spoke numerous times throughout the week and on Saturday we picked up Rio. He is very playful and loving. He and Sassy play very well together. Tank keeps us on our toes and no food is sacred!!!!!! We are grateful to Marcia and Jose’ for the opportunity to allow us to add Tank to our family.